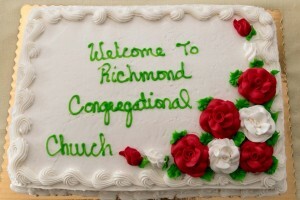 Thinking of joining us at the Richmond Congregational Church, UCC? Please do – we’d love to meet you! We’re located at the corner of Church Street and Bridge Street in Richmond. Below we have addressed some common questions that people sometimes have – feel free to read on, but to sum it up briefly – YOU are welcome here. Come as you are. Where should I park? Most people park across the street at the library/Post Office parking lot. If you have mobility issues or young children, feel free to park on Church Street closer to the door. How do I know what’s going on during the service? When you enter church, the ushers will hand you a bulletin, which lists the order of worship for that service. It contains the text of the prayers, and lists the numbers for the hymns we will be singing. You will find most of the hymns in the hymnals in the pew racks. Who may take Communion? All who seek a relationship with Jesus Christ are invited to take communion. We receive communion once a month, usually on the first Sunday. In an effort to be all-inclusive, we serve non-alcoholic grape juice and gluten free bread. On days when communion is served in the front of church, those who are unable to come forward may signal an usher and be served in their pew. Fellowship – After church, you are invited to join us in the Parlor (at the back of the sanctuary) for fellowship time and refreshments. This is a good time to meet members of the congregation, ask questions, and have a hot/cold drink and a snack. At that time, children are dismissed from Sunday School to join us. What should I do with my children? Children are welcome! From September – June, nursery care and Sunday School are available during the worship service. Some families have their children stay in church the whole time. Usually, there is a Children’s Message early in the worship service, after which children are invited to go to Sunday School. There is a children’s offering during the children’s message, and the proceeds are donated to charities voted on by the students. In the summer months, our nursery is available for parents and the “young and restless”. 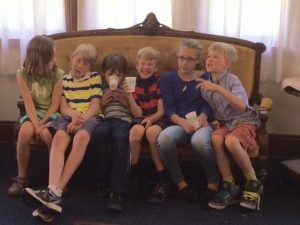 Children ages 5+ are invited to the “Meet Me At The River” summer program. Leaders & children walk to Volunteers’ Green for a bible story/activity, play time, then back to church for fellowship. When parking, please feel free to park along Church Street, as close to the entrance as you can. There are also two spots directly across the street in front of the library. We have asked members to leave spaces closest to the church available for those with mobility issues and/or young children. Guide dogs are welcome. At services when communion is served at the front of the church, ushers will bring the elements to those who may not be able to come forward. Please alert us when you arrive, or simply raise your hand at the beginning of communion to receive communion in your pew. Please ask an usher for any assistance you may need.